I'm just back from holidays, I spent 8 days in Portugal and again got tanned. My usual approach of factor 50 sun cream and avoiding the sun seems to have again resulted in a suntan. I still don't know if a tan impacts the fading. I had to postpone my first Picosure session due to getting unexpectedly tanned in Italy. The tattoo is now beginning to look really faded. I was supposed to have a session in early August but decided I would be better postponing that until October. I think waiting was worthwhile. I've noticed a lot of fading in the last couple of weeks, I don't think it would be so apparent had I had a session three weeks ago. 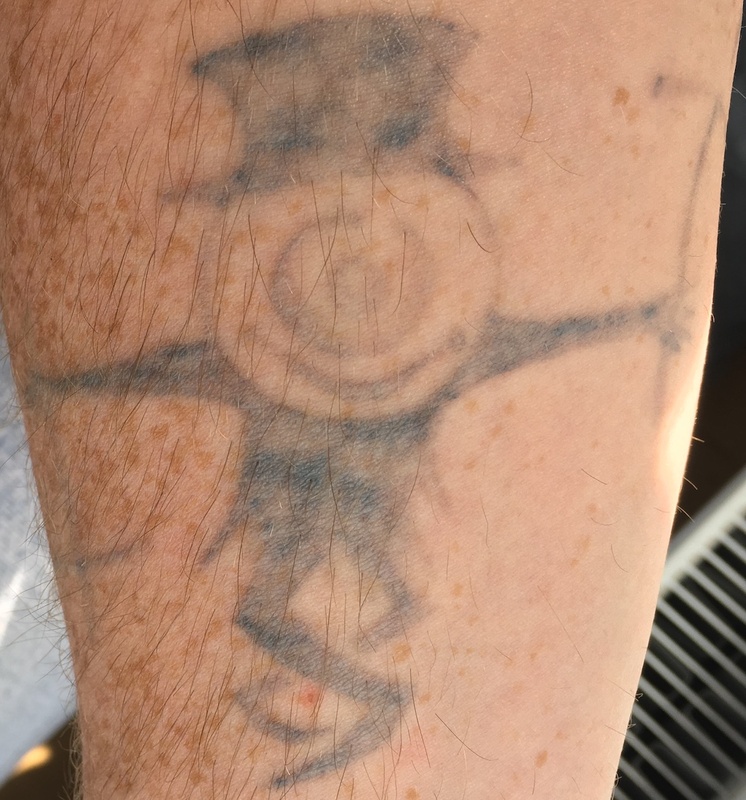 One of the things I've realised is that there's no magic point in tattoo removal where suddenly it's nearly gone, it's just a gradual fade. Everything I read said this but I still expected something different. You may have moments where you notice a significant fade but it will be a fade, not a vanish. However at this time I'm pretty happy with the progress, I'm starting to see some of the darker patches become more see through and some of the lighter show up even more skin colour. I'm pleased. I'm still trying to work out if six Picosure sessions will be enough for removal. I'm thinking now that it might. The picture was taken today. Yes, my arm is tanned in that photo! That's what my pasty Irish skin looks like with a tan. The darker bits of ink are still there and still darker but it's really beginning to clear now. The hat looks so thin now as does the leg with the knee on the right hand side of the picture. That leg was one of the darker parts of ink and it's looking very faded now. If I stretch the skin on it it goes very white with some spots of black. I think the next session could clear that completely. There are still some obviously darker patches, but when I stretch the skin, some white appears beneath. Sadly I don't have a macro lens, I'd love to get some macro shots of it to see how it looks at macro level. The tattoo will be 15 years old on September 19. Curious to see how it will look on it's 15th birthday.